Eric Mink is a writer, adjunct professor, former newspaper op-ed editor/columnist and former television critic in New York and St. Louis. I've been lucky in life to have the love and support of family, friends, teachers, mentors, and colleagues, to say nothing of countless kindnesses shown me by people I don't even really know, many of them readers. Yet only a relative few have had a hand in shaping the kind of person I am, my late parents and my three siblings among them. Ali's death Friday night has dimmed the light in the universe a little. I hope it was for him a gentle end to years of courageous, graceful struggle against disease, even as it concluded his faithful work for peace and a purpose greater than any one of us. I'm saddened, of course, and inevitably thinking about his impact on my life and about the two fleeting encounters we had that were so momentous to me. 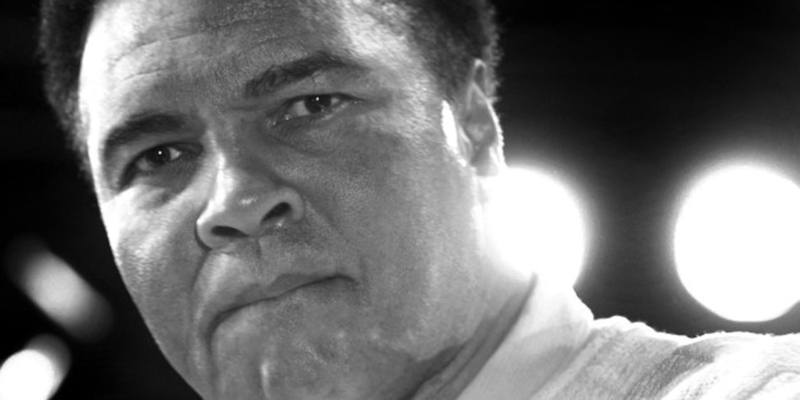 Ali's personal pursuit of fair treatment under the law began about two years before mine. With the Vietnam War raging and young men subject to a mandatory military draft, Ali and I both sought official designation as conscientious objectors to war and killing. Federal law explicitly provided exemptions from military service for those who met the category's qualifications. In September 1968, when I applied to my suburban St. Louis draft board for C-O status (technically, 1-O), I was a 20-year-old white kid starting his senior year in college. I had no idea what I would do with the rest of my life. When Ali requested, in February 1966, that his Louisville draft board grant him C-O status, he was an irrepressible, 24-year-old black man and the heavyweight champion of the world. My objections were rooted in the example of my father's personal non-violence (he served with distinction in an Army medical unit during World War II); the teachings of my faith, Judaism; and personal beliefs and values that had begun to take shape during my high school years and in college at George Washington University in Washington, D.C.
With guidance from the Jewish Peace Fellowship and other groups, I fortified my application to the draft board with excerpts from the Torah, the Talmud, and the prophets and with letters of support from rabbis and my college professors of religion and philosophy. Ali was publicly vilified. His religious beliefs were demeaned. He refused military induction on principle and was indicted, convicted, fined, and sentenced to prison. He lost legal appeals for more than five years before being vindicated at the U.S. Supreme Court on June 28, 1971. The struggle cost him millions of dollars in legal fees and boxing income he couldn't earn because sports authorities wouldn't let him compete. My case was over in less than a year. There were no court proceedings and no legal setbacks. It cost me virtually nothing. I was demeaned only once: During a 15-minute private hearing, one of the draft board members mocked my claims. In July 1969, the board granted my application for C-O status. I had seen Muhammad Ali in person for the first time just two months earlier. He was fighting in Washington, but not in a boxing ring. He was on stage at GWU's Lisner Auditorium, a stop on his three-year college speaking tour. Ali was taking his battle with the government to campus communities as opposition to the Vietnam War grew and as the specter of the draft loomed ever larger. I saw him at Lisner on May 5, 1969, a month before I graduated. Ali's presentation included some of the Nation of Islam's dreary race-separation talking points (without anti-Semitic slurs), but when he turned to war, peace, and the law, his arguments -- amplified by the irresistible force of his personality -- electrified the crowd, me included. The sheer power of his presence and seeing and hearing him talk about his quest for justice -- the end of which was very much in doubt when mine began -- made me see the obstacles in my path more sharply and intensify my focus on how to overcome them. Ali's refusal to betray his religious beliefs and his determination in the face of the powerful political, social, and legal forces marshaled against him gave me strength. The logic, humor, and anger he directed at ignorant institutions that insulted his faith and nullified his championship inspired me. And I took great heart from Ali's willingness to risk his freedom by insisting that his government treat him fairly. The last time I saw Ali was on March 20, 1992, at the St. Louis Post-Dispatch, the newspaper where I worked at the time. He had come to my hometown to attend a Leon Spinks fight and to promote a business deal with Sprint that benefited the Muhammad Ali Foundation. He was being interviewed by a reporter and an editor, and I tried to monitor their progress from across the newsroom. I hoped to grab a moment with him afterward, but I got pulled away. So I didn't hear the burst of applause that greeted him when he emerged from the conference room, and I didn't see him exit the fifth-floor newsroom. Told that Ali had just left, I flew down five flights of stairs and ran out of the lobby onto the street where a limousine was parked at the curb, motor running. I knocked on a darkened side window and pulled the door open. Ali, alone in the back seat, looked over at me. Breathless and nervous, I ducked my head into the car, extended my right hand and said, as best I recall, "Champ, I just wanted to say how much I admire you and what an inspiration you've been to me." And then, in an instant, his face softened. He smiled. He extended his hand, took hold of mine and held it warmly. He had only pretended to have mis-heard. Ali had played a trick on me, something he took delight in doing to people whenever an opportunity arose. I took a breath, smiled back at him, thanked him again and closed the limo door. We had completed a circle. Parts of this column originally were published by the St. Louis Jewish Light.